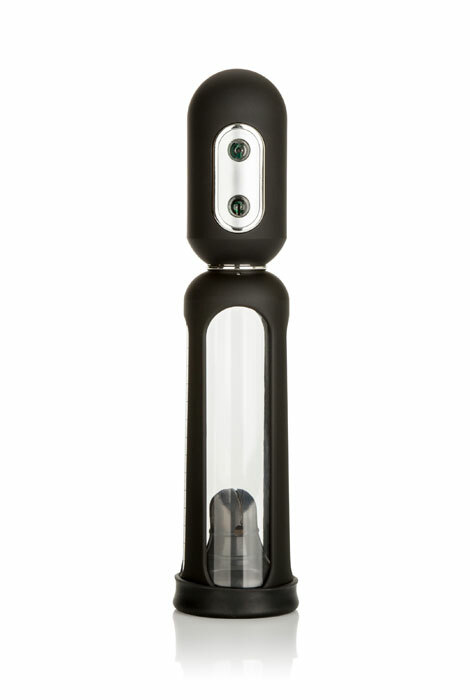 Fully automatic, see-through pump lends him a helping hand, letting him track his growth as 3 ascending levels of suction power take care of the "hard" work. With a flanged base for a secure seal, this high-tech tool is totally self-contained and wireless. Textured controller and measured cylinder offer a safe, non-slip grip with a quick-release air valve for when he's reached his full potential. Requires 3 AAA batteries (not included). 7 1/2" L x 2 1/4" dia. Great product, works really well, use once a day! Looking for help with husband's ED and the rating is good on this. He used a manual pump for years however it has thick bands we place around the pump itself . Once he's reached his maximum size, these bands are pushed off the cylinder and onto him...this part is painful for him. Does this system use a similar method for keeping the erection? Can the banding be done more humanely? BEST ANSWER: Thank you for your question. This does not have bands and will suction until the man has reached his full potential.We hope this information will be of help to you.